Restoring lives by restoring vision. A yoga and meditation lifestyle company, bringing the ashram wisdom to you! 10% of net profits go to support our The ThirdEyeVision Foundation. To view and purchase mala beads, check out Ashramchic. Dr. Ruelas with mala maker for Ashramchic. ThirdEyeVision Foundation’s mission is to alleviate preventable blindness to low income individuals in foreign countries. Preventable blindness is defined as loss of vision that can be corrected. Globally, 80% of all visual impairment can be prevented or cured. Helping others see clearly allows a quality of life that will lead to heightened economic productivity across many communities that suffer from preventable blindness. Since ThirdEyeVision’s inception, mission teams have traveled to five different countries, Peru, Brasil, Lebanon, Haiti and India, where the need for eye care assistance was the greatest due to the countries’ challenging terrains and lack of eye care supplies and trained professionals. 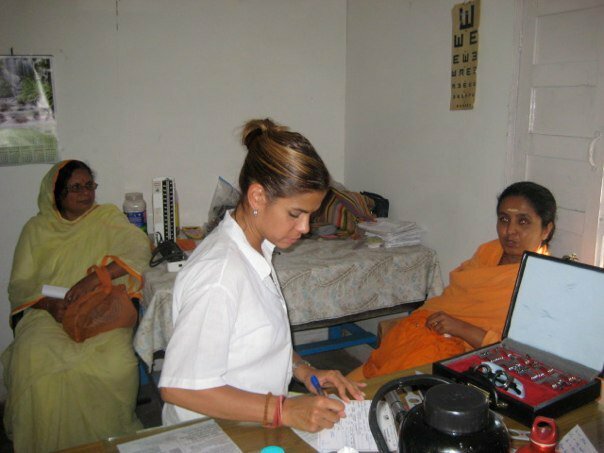 ThirdEyeVision’s primary present focus is in the Himalayas of India, Uttarkashi, where we have conducted five clinics over the last six years at the Sivananda Ashram. ThirdEyeVision’s goal is to establish and support sustainable eye care facilities equipped with proper equipment and trained staff so that the quality of the care ThirdEyeVision provides will be present all year round. ThirdEyeVision issues eye glasses, medication, ocular pathology screening and treatment, cataract surgeries and pre-op care. We would like to expand to deliver the following surgeries: retinal, refractive and oculo-plastics. Donations by ThirdEyeVision Foundation to foreign organizations are ensured to further ThirdEyeVision Foundation’s exempt purpose because all donations by ThirdEyeVision Foundation are made directly to provide services or are made as in-kind donations. Our distributions consists of medical services, eye-health care camps and medical and optometric equipment. In addition, ThirdEyeVision Foundation services include training at each mission site to enable continued eye care in ThirdEyeVision foundation communities. Additional expenses include mission expenses such as airfare, lodging, meals, land travel, and glasses for patients.